One of the things that irks me when reviewers feel the need to denigrate a previous version of a book, movie or comic when talking about the new version. Comparisons are sometimes unavoidable but at the same time you don't have to tear something from the past down to make the new thing seem awesome. In the spirit of that sort of thinking you won't be reading about how I think The Death of Superman is so much better than Superman: Doomsday. I mean it is but that comes down to personal preference and, to be fair, I wrote a rather glowing review of Superman: Doomsday for this site back in 2007. 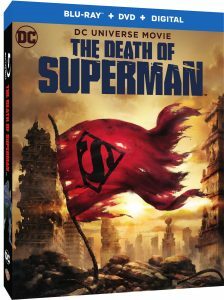 Obviously, I enjoyed that movie back then, but The Death of Superman is the movie I wish we had gotten eleven years ago. Continuing the idea of being fair the reason I liked the new The Death of Superman is because it was more like the comic book event from 1992 and my love for the event goes beyond all reason. So, it makes sense that I would prefer a more faithful adaptation than a very well-produced take on the idea. And The Death of Superman is extremely faithful to the comics. It's not slavish. For whatever reason the studio decided to have this movie be part of the animated universe they kicked off with Justice League: War and there was a fair amount of social media outcry over the costume in the film but about ten minutes into the movie I didn't care what universe this was set in. From the jump we were given a movie where the people involved seemed to actually like the idea that Superman would be a beloved hero in Metropolis. Not only did this line up with my personal view of how the character should be treated it set the table for the heart wrenching ending to the film. If we don't see people caring about Superman and what he represents his death will not have the proper impact. It will be a plot point and not the emotional roller coaster it was. But I'm getting ahead of myself. From beginning to end I was totally engaged with this movie. The opening scene where he takes on Mannheim was brilliant and even though some might think the line about him not liking bullies might be ripping a certain star-spangled man with a plan over in the other universe I would argue that Superman has always been about not liking bullies. On top of that we see characters like Maggie Sawyer, Dan Turpin, Dr. Kylburn and, most importantly, Bibbo all within the first 12 minutes. These are supporting characters that used to be important to the Superman titles and Bibbo was one of the emotional lynchpins of the comic book version of the Death and Return of Superman. Seeing them let me know that the film was on the right track. Lois was another highlight. 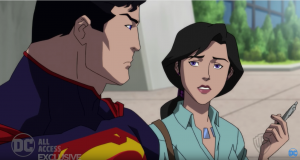 I liked how the people behind the movie flipped the script from the 2007 film and had Lois dating Clark instead of Superman. Does this have anything to do with the fact that this is how I prefer to see the relationship between the two start? Probably. I will cop to any charges that I have a bias when it comes to a certain era of Superman. It doesn't mean I'm wrong about the film. The relationship problems between Lois and Clark felt real and the dinner with the Kents was a nice way to highlight this. It also gets The Kents into Metropolis for the story, which saves time at the end of the film but that's more of a structural thing and one that I really liked. My point is that exploring Clark and Lois' relationship and showing the key moment where Clark reveals his identity to her is another element that gives Superman's death meaning. The conversation in the Ace O' Clubs is one of the best identity-reveal scenes I have ever seen. The fact that it was punctuated by the note telling Lois that Clark loved her made it even better. Lois standing up to Doomsday was yet another highlight because not only did it serve to give Superman the extra push he needed for that final blow, but it also showed how far she was willing to go to stand with the man she loved. To me that's important and I am glad it was there. The Justice League and their relationship to Superman was another plus for me. I liked seeing them working together, either in smaller groups or as a team having a meeting. That meeting profived some levity but also played into why Superman revealed his identity to Lois. The League's fight with Doomsday was also epic and it was nice to see Batman basically serving as a distraction while the bigger guns got their shots in. And then there's Doomsday. I loved how they played Doomsday in this movie. He is a walking engine of destruction and right in line with how I think the character should be portrayed. Doomsday was crafty and vicious and just would not be stopped, which meant every blow Superman managed to land was a minor victory. I was a little confused at the sudden burst of heat vision but I assume that is something that will be explored in the next film. Another high point was how they managed to weave in the would-be Supermen that will reign over Metropolis in the next film. John Henry Irons meeting Superman early in the movie and then forging the S shield at the end was great. Seeing Dabney Donovan point to the clone that will be Superboy was also great and seeing the kod grab the jacket at the end of the movie made me smile. Introducing Hank Henshaw and the crew of the Excaliber was a nice surprise and if things play out how I think they will Hank's motivation in the next film was set up nicely here. And the shot of a Kryptonian wearing a visor at the beginning of the movie set up the taking of the body at the end and the introduction of a certain Eradicator. Now they can jump right into the action with the next movie and not worry about introducing everyone brand new. Rating - 5 out of 5: Finally, all of the nods to the comic book version of the death from 1992 was just freaking awesome. Doomsday fighting wildlife? It was there. 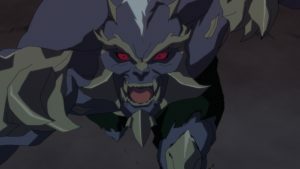 Doomsday killing the first humans he encounters? Check. Doomsday fighting a Justice League? That was there. Superman having to stop fighting to save a boy and his mother a la Mitch and Mrs. Anderson from the comics? That was there. The Kents watching the fight on television? Yup. Those final moments brilliantly echoed the final moments of the comic book battle and taking Bibbo's prayer from Funeral For a Friend and putting it into this movie nearly had me crying. It was like the filmmakers knew there were people that loved the 1992 story and did things just for them. I know that other people have their quibbles with this movie. I know that upon further viewings I might find some issues myself. For my first viewing and thus my total, fresh out of the kitchen reaction? I loved it. If you read and loved the story from 1992 this movie is for you. If you have never read the comic book version and liked the film this should make you want to go ahead and track them down. 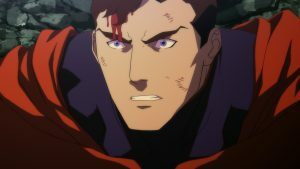 From beginning to end it was an emotional experience and I am so glad they decided to not only go back and redo the death but follow it up with an adaptation of Reign of the Supermen. I also recommend the special features. 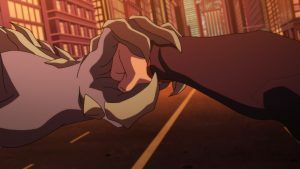 The sneak peak has me totally jazzed for the next movie and the Death of Superman: The Brawl that Topped Them All was an enjoyable special feature. Not as good as the Requiem feature from Superman: Doomsday but a good special feature nonetheless.